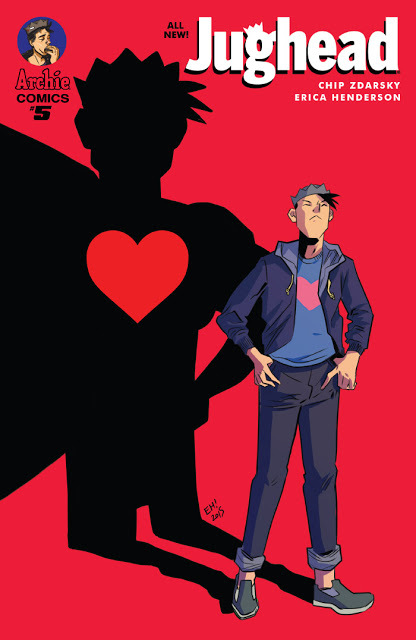 One of the great things about 'Jughead' by Chip Zdarsky and Erica Henderson is that you don't know what crazy adventure Jughead's unconscious will take him on from month to month. His dream sequences have become a staple of the series so far. And this month 'Jughead' doesn't disappoint. The ongoing suspicions of taskmaster and new Principal Stanger force Jughead and the gang to investigate on their own.None of their parents believe that the school has turned into a training ground for spies which sparks Jughead to look into Stanger's previous place of employment. That leads the gang to nearby Sunnyside to interview students like them to get some intel about Stanger's history. And when I say students like them I mean it. Zdarsky continues to feel more at ease with these iconic Riverdale characters and it shows in this issue especially. The interactions with the kids in Sunnyside are funny and perfectly idiosyncratic to Jughead, Archie, Reggie, Betty, and the rest. Henderson's art joyfully captures expressive faces of a myriad of emotions from shock, infatuation, anger and depression. Jughead's dream sequence with a familiar team of heroes led by Captain Hero is a clever subversive and satirical look at "gritty" superheroes. Henderson again soars with beautifully rendered action that gives the dream some weight while providing some laughs. 'Jughead'is one of the most enjoyable reads in comics right now and you don't have to be familiar with Archie Comics in order to dive right in. Zdarsky's approach is fresh and funny while staying true to the character. Henderson is the perfect artist who's dynamic enough to capture the range of emotions and action each and every month. The main conspiracy is still a mystery but it doesn't matter when the journey is this much fun.